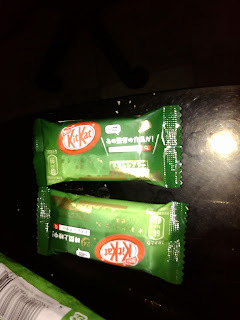 Alright, a few of my recent acquaintances over facebook have been ranting about how Japan has all these different flavors of Kit-Kat and that we never get them here in the Philippines. Well... ta-dah! 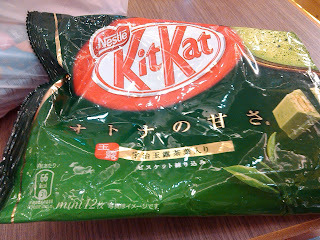 Locally bought from the "Oriental Goods" section of Robinson's Supermarket, here it is: one pack of green tea Kit-Kat minis at 12 pieces per pack for 230 PHP or approximately $5.10. Anyway, it's a bit more expensive than other imported snacks here... but not by much. I thought I'd give it a try, and thus, we come to the raison d'etre for this post. 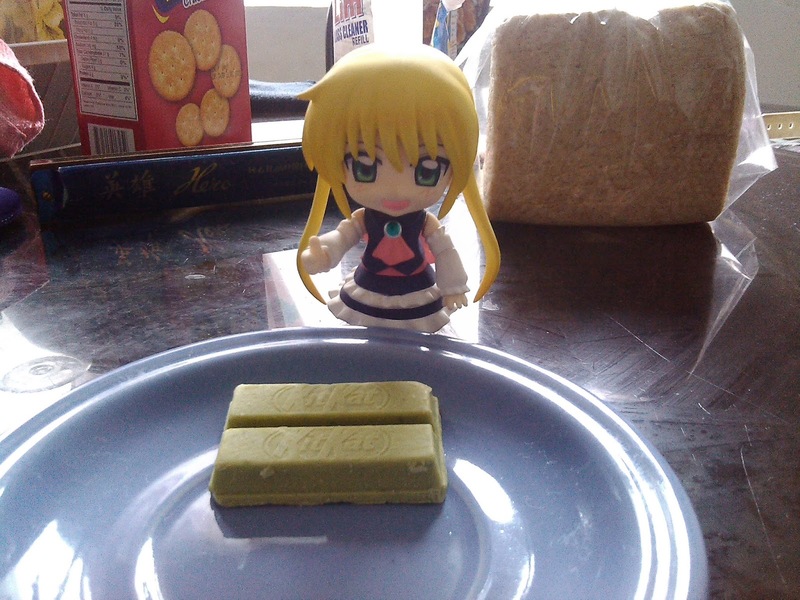 Well, it's chocolate that's apparently been somehow infused with green tea flavor using some bizarre form of alchemy or something. It just looks like a really greasy greenish kit-kat. The color sort of reminds me of iceberg lettuce or seaweed. It doesn't lookt too unappetizing, but it doesn't exactly look that good, either. 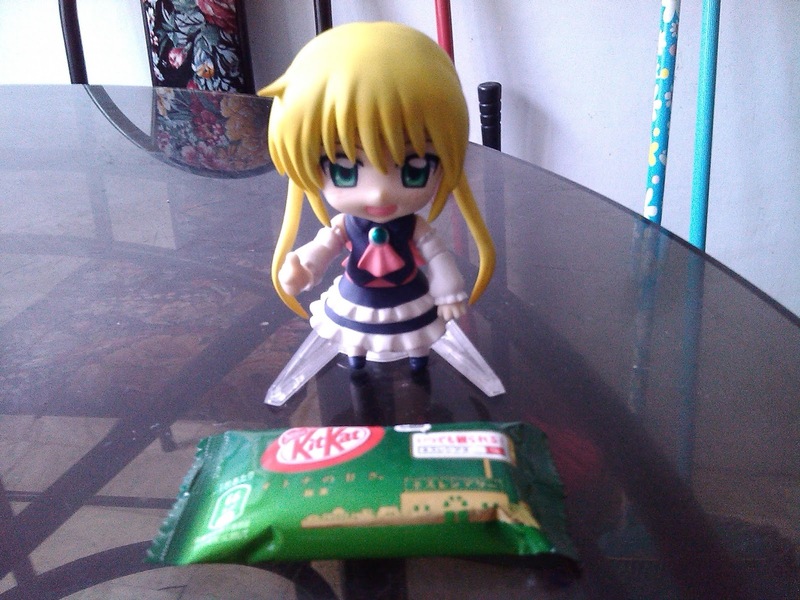 It's about 20% shorter in length than a regular kit-kat. I suppose the ingredients makes it more costly to produce? Either that, or it's just that the Japanese love their tiny, cutesy stuff. It tastes... surprisingly like green tea, if you've ever had some (green tea, I mean). From the first bite, the taste of green tea is almost overpowering -- not that it's a bad thing. Green tea has a slightly minty and slightly earthy taste to it, so if you're not into that, you might want to give this little snack item a skip. The actual green tea chocolate has an abrasive, sandy texture on the teeth, but it actually gets creamier and tastier the more you eat it. It's sort of like a "melts in your mouth" thing. The wafers add even more crunch and texture to the chocolate making it feel like you're actually biting into something rough, but soft on the outside but crunchy on the inside -- kinda like a reverse french-fry. ... Nagi ojou-sama! Ain't she so kyawaii? It also has a bit of a greasy, oily texture on your fingers and mouth, but I didn't really mind that. Some people might though. It's a rather niche snack and honestly, it's nothing special. It is pretty cheap for an imported "rare" Japanese snack however, so you should give it a try if you ever come across it and find out how it tastes for yourself. I personally like it, but I feel that it might come down to individual tastes. Nagi gives this snack a thumbs-up!